Meadow's Edge is bordered by forest service land, with a classic black hills tree line view. Guests of this new home will fall in love with the beauty inside and outside. Enjoy the tranquil serenity of the trees, meadow, and visiting wildlife from the hot tub and patio. While this home has a country feel, it's just over the hill from downtown Hill City. Meadow's Edge is centrally located for all Black Hills activities. Being on one level and wheel chair friendly, this home can easily accommodate a group of 10 on vacation, while not feeling too large for a romantic get away. Stunning from top to bottom with new appliances and a gorgeous walk out shower in the master. 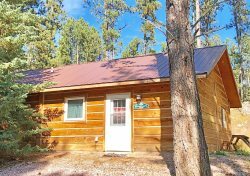 Meadow's Edge is the perfect place for your Black Hills Vacation! There is no off street parking in this neighborhood, please park cars, trailers, and ATV's in the garage or driveway. No RV's or campers are allowed to be parked in this neighborhood at any time. We loved the home! It had everything you could possibly want in a vacation home, well stocked kitchen, games for kids to play, quality furnishings and very clean. Great location, a short walk to Mickelson trail and downtown Hill City. Convenient to Rushmore, Custer State Park, Jewel Cave, Wind Cave, Mammoth Site and other tourist attractions such as Bear Country and Reptile Gardens. We enjoyed making smores on the fire pit and the kids enjoyed the daily visits from the deer. Highly recommended for any stays in the Black Hills. Lee Ann was fantastic to work with and to answer all my questions...quick, courteous and above all HAPPY! As a foster family who doesn't get much time away from a house full of kids, family time means everything. From the first night where we were visited by a dozen deer drinking from the pond and a couple of horses running in the field...to the last when we sat in the hot tub wishing we could stay longer...this place was FANTASTIC. Yes, the cost is higher than staying at a chain hotel especially during peak season, but if you calculate value in ways other than just dollars this is truly an exceptional place to stay. Imagine arriving back home with a suitcase full of CLEAN clothes...a cooler full of home-cooked leftovers...a camera full of memories...and smiles on everyone's faces. I don't have to imagine it...it actually happened. Yes, it is THAT NICE and I can't wait to bring the rest of the family back!! We had a great time at the cabin. The place is amazing and fit our big family perfectly. The forest is right behind you but the access to town is less then a mile away. We had a Great Family vacation here, house was a great central location for each days adventures. There were 10 of us that stayed here 8 Adults, and 2 kids plenty of room for us. The House has a great set up, loved the master bath shower. Big patio out back over looking the hay field deer our there at all times of the day. Fire ring came in handy for the late night fire and smores.. thanks for the great time. Meadow's Edge was the perfect place to stay! The property itself is close to town, but secluded enough that it felt private. The house was beautiful, spacious, and clean. The cost of staying there was less than what our family would have paid had we rented hotel rooms, and it was so much nicer than a hotel! We greatly enjoyed our stay!